Here's the headline: original singer Jorn Lande is back with Masterplan. For longtime fans, this is all they want to hear, no matter the caliber of Masterplan's fourth release Time to Be King. As much as Mike DiMeo (formally Riot and The Lizards) filled the bill for Masterplan on MKII, many fans and critics took a pass. I was not one of them; I think it's a good album. But purists, being exactly that, want what they always want: a return to the roots. Like Queen will never by the same without Freddie, no matter who steps up to the mike. So now Masterplan returns with Jorn Lande and they pick up where they left off with their highly acclaimed debut. While Jorn Lande may be back in the fold to recharge Masterplan, Time to Be King is merely a return to form for the band. This is strong melodic heavy/power metal which made them famous. If you're looking for novelty or subtle nuances of experimentation, it's not here. This is Masterplan at their best and brilliant, and few bands do it better (although there is some major competition out there). The genius of Masterplan is combining massive vocal arrangements with sterling guitar solos over a driving rhythm section. Fiddle of Time, Time to Be King, Lonely Winds or War, and The Sun is in Your Hands are quintessential and blazing Masterplan. Throughout Lande does his best quasi-mid eighties Dio to roar and scream. Often he sounds better when he mellows out. But he's still one of the best metal singers of our time. Jorn kills on Under the Moon, one of the finest cuts here, and Far from the End of the World. In the end, as I said, Time to Be King is pure Masterplan: epic and entertaining, from one the best melodic power metal bands in the universe. Quite recommended! 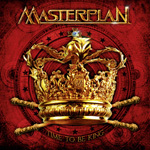 Time to Be King is pure Masterplan: epic and entertaining, from one the best melodic power metal bands in the universe. Quite recommended!